Available in small, medium, large & extra large, 100% Cotton Tees, only in white for the time being. This religious symbol logo expresses inclusion for all under one simple title. A perfect rebuttal to those obnoxious Unitarian “coexist” shirts. 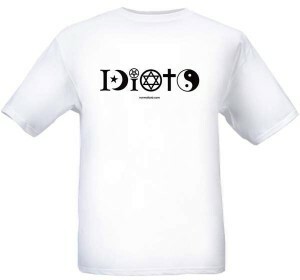 ($20) Available only in white for the time being, this obnoxious rebuttal to the Unitarian “coexist” version made famous by Bono. Incredibly safe and secure with Paypal. All orders are sent out 2 Day Priority (Flat Rate) mail. There is no quantity limit. For additional shipping information please feel free to contact me directly.